BLC_ADMIN_USER AdminUser Represents an admin user. 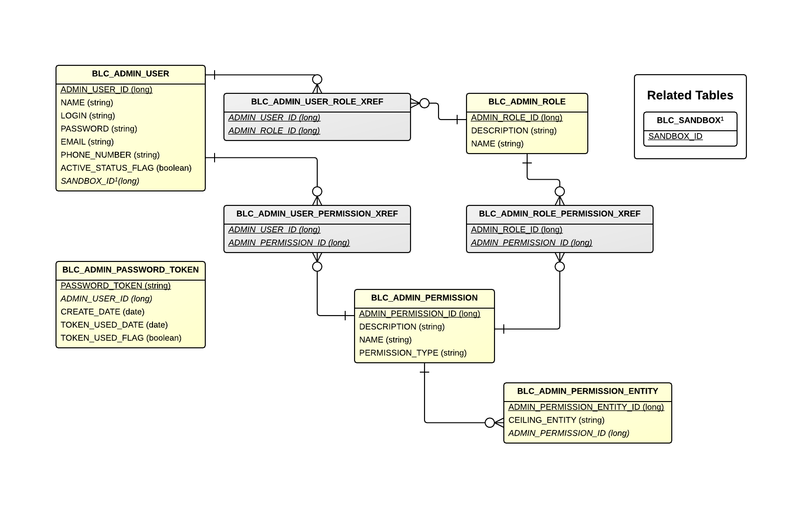 BLC_ADMIN_USER_ROLE_XREF - Cross reference table that points to an admin user role. BLC_ADMIN_ROLE AdminRole Represents an admin user role. BLC_ADMIN_USER_PERMISSION_XREF - Cross reference table that points to an admin user permission. BLC_ADMIN_ROLE_PERMISSION_XREF - Cross reference table that points to an admin role permission. BLC_ADMIN_PERMISSION_ENTITY AdminPermissionQualifiedEntity Represents an admin user permission entity. BLC_SANDBOX SandBox Represents a sandbox.